Jailbreak CDI for Vespa, Piaggio, Aprilia, Italjet and Derbi Scooters with Immobilizer and carburetor. Eliminates Immobilizer. Only for models with Carburetor. 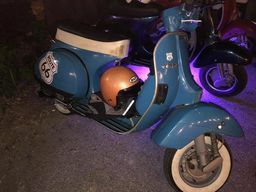 Didn't get a brown or red master key when you bought your Vespa and now you've lost your blue key too? Bought a bike at an auction with no keys? Or just lost your keys? Go online and find out about all the difficult and time consuming ways you can get your Scooter running again by erasing your cdi, replacing it, having someone clone your keys, taping the chip key to the immobilizer antenna, etc. Or get our Jailbreak CDI and never worry about it again. Plug and Play, it's that simple. Want new keys? Now you'll save on those too, by using regular Vespa Keys, part 573512, or any blank the locksmith has that will fit. APRILIA Scarabeo 125 SOME Compare Plug BEFORE ordering. APRILIA Scarabeo 200 2003-2008 SOME, Compare Plug BEFORE ordering.